Looking for a quick overview of what’s new and hot from the past week at SheKnows Parenting? Check out our SheKnows Parenting week-in-review. From recent parenting news to can’t miss tips, it’s all here! This week’s highlights include Snooki’s pregnancy (and baby’s nickname), St. Patrick’s Day fun for kids, a horrible insult to single moms and more. Snooki, Elizabeth Berkley and more pregnant stars. Celeb bump day. Our roundup of pregnant Hollywood. Oh no. Snookie and Jionni select a nickname for baby-to-be. Baby naming scare via baby Hold. Mommy Tweets. Patricia Heaton, Snooki and more. Patricia vs. Rosie O’Donnell — wow! Party fun for kids. 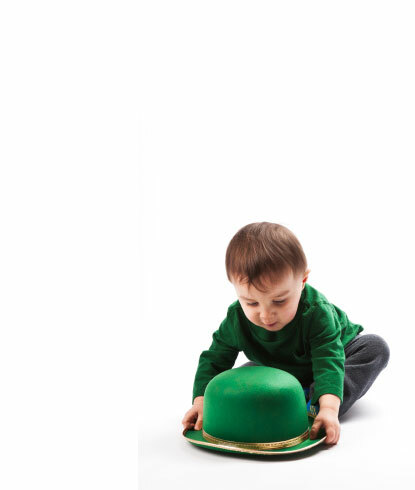 St. Patrick’s Day party ideas for kids. Have a green St. Patty’s Day party. St. Patrick’s Day inspiration. Lucky Irish baby names. The perfect baby name in honor of St. Patty’s Day. Get your St. Patty’s Day craft on. St. Patrick’s Day crafts for kids. Leprechauns and shamrocks and rainbows, oh my! More than just a day for green beer. Who is St. Patrick anyway? Get the 4-1-1 on the man behind the day. Wow! Offensive, much? Are single parents also child abusers? One senator’s really dumb idea. One stay-at-home dad takes on a diaper manufacturer’s campaign. We’re dads, Huggies, not dummies. Pregnancy and Baby. Do you parent like a star? Celebrity parenting styles. Do it like Alicia Silverstone. Mom story. I was homeless with three young kids. An inspiring story of determination. Would you pay for a girl (or boy)? How do you feel about gender selection? Mom Blogger Face-off. Fun and easy crafts. Spring crafts for kids. Welcome a new season with your children. Soothe the SPD stress fast. How to deal with Sensory Processing Disorder meltdowns. SPD tips from an experienced mom. Beware of social media. Is your tech savvy babysitter a danger to your child? Set social media ground rules. Opening the lines of communication. How to talk to your kids about substance abuse. Use the Whitney Houston tragedy as a teachable moment. Do you share your smart phone with your baby? Raising baby in an iWorld. Tech in 2012.